Interesting times. I took a quick look at Cirrus's website and noticed that their SR22T is 3,600 pounds at max gross weight. I guess the speed of that aircraft exceeds 150 mph. Anyway, between Basic Med, changes to the LSA category, the part 23 re-write, and progress in autonomy, things are changing rapidly ('rapidly' being a relative term here). I am not sure what direction these changes will take, but I am interested to watch and find out. Side note: here is a website (https://xwing.com) that talks about a possible future of aviation that is interesting to consider. I guess most pilots would agree that self-flying planes should be easier to achieve than self-driving cars. I would say that developing self-flying planes could be developed with existing technologies. The challenges are (a) regulatory, and (b) economic. Anyway, I am interested to read people's thoughts on how different rules would affect the state of aviation for those of us in light sport. Also, does anyone have any idea how long it takes to go from proposed rulemaking to actual rules? I don't have a clue. 3600lb? Wow, that would be more than most of us (including me) even hoped for. They mentioned a 172, so I guess the two seat limit is gone too? If so, that is pretty ground-breaking. It's only a small jump from that to doing away with third class medicals. I wonder if that is the direction they are moving toward...? 150kt, 3600lb, 4passenger are the only increases. There are so many planes out there under 3600lbs but have prop or gear complexity. What goes 150 with fixed gear and fixed prop? It's unclear if it's 150mph or 150 knots. Pelton is quoted as saying 150mph, but perhaps he meant 150 knots. On Jan. 19, 2019, Pelton said, the FAA will publish a notice of proposed rulemaking that seeks to raise the weight limit for light sport aircraft from the current 1,320 pounds to 3,600 pounds. “That will allow you to fly in a 172, have four seats in the airplane, and fly 150 mph,” said Pelton, who also anticipates a rule change that would allow professional builders to construct experimental amateur-built aircraft. 150 mph is possible in a 172. No chance if it's knots. Note that Pelton said the airplane could have 4 seats but did not state you could fill them. It could be that an SP will be able to fly a 4-seater aircraft but only carry one passenger (think Recreation Pilot limitations). In a way this makes sense as BasicMed would allow for more passengers. Just my opinion. Would be nice if 'night' was added. Cessna 180 with a Robertson STOL kit? There certainly are a few, but not many most could afford or fly. If they are going to keep a stall limit I like 60-65kt. Does the stall kit lower the clean stall speed that much? Reads like a bunch of cold water being dumped on the earlier reports! This gets exciting when you look forward. The limits will be set then the designs exploiting the new limits will emerge and aviation will take an interesting leap sideways. I don't know but probably not. It's been 15 years since I flew one, a C-185 actually but similar. I don't want to trade my CT...I want FD to increase the gross weight on it. I'm 65 years old and own a 12 year old CTSW. Will and how will this sweeping change effect me? If you only really fly your own LSA (like me), then this probably won't impact you at all. You might be able to increase MTOW at some point but this may not make a difference to you given the age of your plane puts it before the porking up period of S-LSA. Also, your plane is well down the depreciation curve so I would not expect your resale value to take much of hit either. 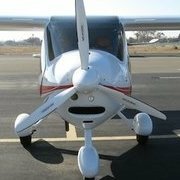 New weight limits could help us ELSA owners...we should be able to log some flight testing and then increase our weight limits. I don’t want much, but if I could go to the floatplane limit of 1430, that would allow my CTSW to fly legally with two 200lb humans, full fuel, and nearly full (90lb) baggage. That would make the utility of my airplane everything I could want in a two-seater. I have said it before and I will say it again, just because an aircraft can be flown on floats at a higher weight doesn't mean that the structure can support that weight without the floats. The floats are rigged with a positive angle of attack, and they are supporting the extra weight while flying, not the wings. Can a CTSW support an extra 110 pounds? I would say probably, but I wouldn't offer an open ended guarantee. For me, the first real limiting factor is climb. I don't want to fly my CT even at gross very much. Available climb is a real get out of jail free card at times. Hence the "flight testing" I mentioned. ? I agree, but depends on what you're doing. I would not want to do your mountain work with a 400fpm climb, but for a long cross country over flat-ish terrain with long, paved runways it might be okay.